This town of 7,000 is the most scenic city on the west coast of Calabria. The old city center lies high above the sea. The main street ends with a view of the cliffs on which the S. Maria dell' Isola church was built in the 11th century. This Norman church with its extraordinary black crucifix is worth a visit. 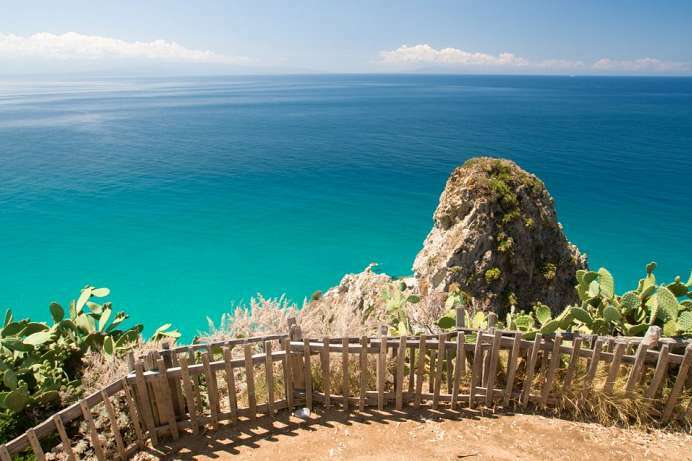 South of Tropea is the most beautiful stretch of coastline in Calabria, the Capo Vaticano, featuring spectacular beaches and clear blue waters. Stromboli, one of the most active volcanoes on Earth, lies just off the coast. This promontory is located on a rock outcrop south of Tropea and offers a sweeping view as far as the streets of Messina. In good weather, you can even make out all of the Aeolian islands. The promontory does not have anything to do with the Vatican. Instead, the name goes back to the Greek oracle consulted by sailors 2000 years ago and means something like “cape of prophecies.” There is also a parking lot, a small restaurant and a short path leading to the overlook. 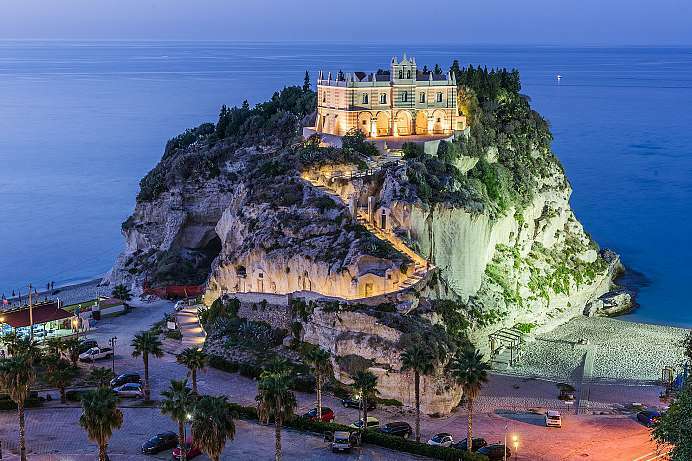 The Benedictine pilgrimage church of Santa Maria dell'Isola is perched on sandstone crags overlooking the beach of Tropea. The history of the church goes all the way back to the Early Byzantine Middle Ages. Climbing the steep stairway to the church is definitely worthwhile. Once there, you will have a wonderful view of Tropea and the mountains behind it. Herbs and cacti grow in a well-kept garden behind the church. From there you can see the ocean and the coast as well as sandy beaches and lonely bays.